Today we got a boatload of greens in our CSA share—‘tis the season, of course, until more things start coming into season. We got romaine lettuce, spinach, arugula, mint, and Swiss chard. I decided to use the arugula to make a pesto. 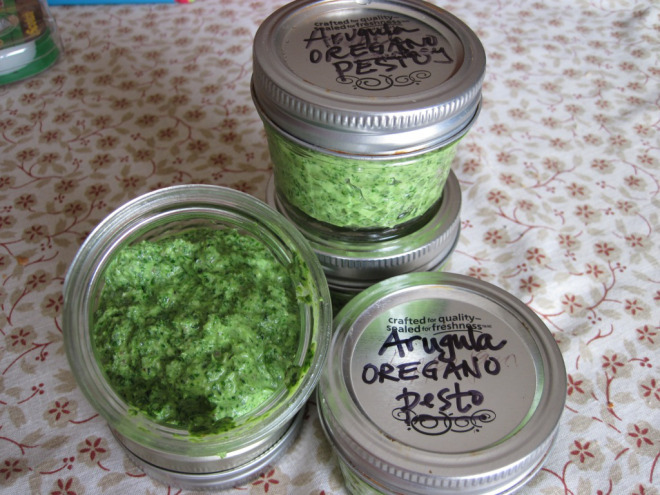 Since I have so much oregano and cilantro coming up in my garden right now, I decided to make two flavors of arugula pesto, one with each herb in it.